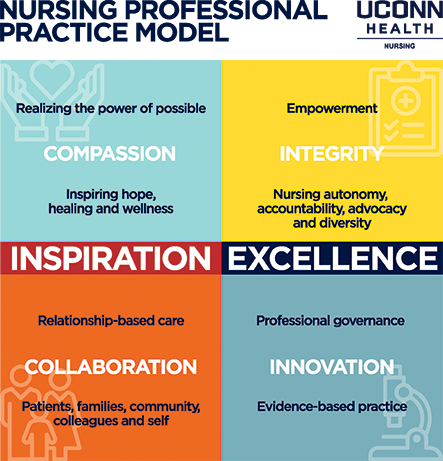 If you want to be part of a team where nurses are respected, valued, and encouraged to learn and grow, you want to be a nurse at UConn Health. Our nurses have opportunities in a wide-range of specialties, as well as careers in leadership, advanced practice, research, and education. At UConn Health, you have the ability to make a difference in patient lives. Explore what’s possible. Have a Question about our Nursing Opportunities? Julie Parrette at 860.679.2597 or parrette@uchc.edu. Staff nurses are involved in daily care bringing ideas to the table. To see the managers and the doctors being so receptive to it. I’ve never in my 14 years experienced that as a nurse. People here really put their patients first. It makes it a great environment to work and to learn in. People are friendlier here. You don’t feel like you're all alone. The management cares about your needs, they listen. From the doctors to the physical therapists and just the whole healthcare team all work as a team. UConn Health is a vibrant, integrated academic medical center that is entering an era of unprecedented growth in all three areas of its mission: academics, research, and clinical care. At UConn Health, the patient experience and innovative health care is paramount. Our talented and dedicated nursing staff is at the heart of ensuring our quality care and patient outcomes. Our nurses have access to new technology to enhance patient care, safety, and satisfaction, as well as professional advancement opportunities. UConn John Dempsey Hospital is the only hospital in the Farmington Valley awarded an “A” patient safety rating by The Leapfrog Group. This Hospital Safety Score is the gold standard rating for patient safety, compiled under the guidance of the nation’s leading patient safety experts. Learn more about UConn Health. Search our nursing opportunities to find a career at UConn Health.